A large sized wall clock in a stainless steel finish. 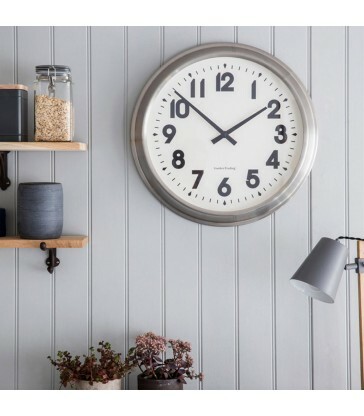 A modern large scale wall clock, perfect for a new kitchen or home interior. And its large sized face means it is easy to read from a distance. For indoor use only. 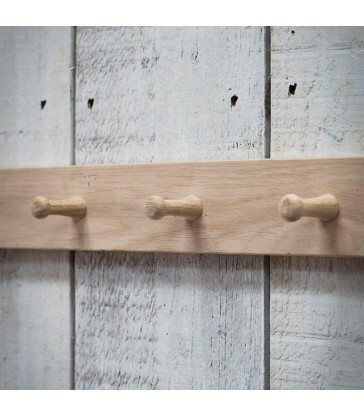 Raw oak three peg rail, perfect for hanging your coats in the hallway. Or why not use to hang your tea towels and aprons in your kitchen. A simple, clean design to keep your home clutter free. As the timber has not been treated you can match it in with your colour scheme by painting or staining it. 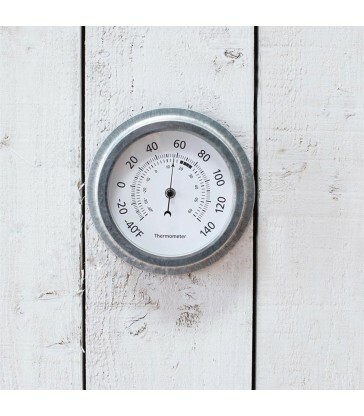 An outdoor thermometer made from galvanised steel. Hard wearing and stylish at the same time. Perfect for use both indoors and outside, even in coastal locations. Great garden gifts for your home. The tide clock. The perfect gift for swimmers and seaside friends. Suitable for use both indoors and outdoors, simply set the clock hand to full tide when there is a full tide at your beach and the clock will automatically do the rest. A great gift for your seaside holiday home.